You get into the Vatican immediately through our official partnership entrance leaving all those long lines behind you. You enter the Vatican 30 minutes before all other tour operators and 1.5 hours before the general public. You explore off-limit areas on our exclusive tours so you don’t have to follow the crowd. 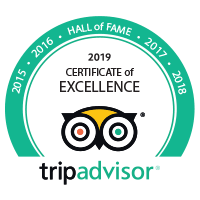 Trip Advisor rated our iconic Vatican Museum, Sistine Chapel, & St. Peter’s Basilica Tour as the most popular in the world out of 570 million reviews. You escape the crowds with instant access and spend more time with our expert guides discovering the stories behind the art when you enter through our official Partnership Entrance. Our Vatican tours include some of the city's most incredible sights, such as the Vatican Museums, the Sistine Chapel, and St. Peter's Basilica. Our local expert guides, Vatican partnership and immediate, faster than “skip the line” access give you benefits that cannot be found with any other tour operator! Enjoy the Vatican Museums with an expert, local guide and No-Wait Entry thanks to our Official Vatican Partnership. Experience the Sistine Chapel, St. Peter’s Basilica, Raphael Rooms and more on this signature tour. Limited to just 12 people, our Semi-Private Vatican Tour is the most intimate way to see the Vatican. With our Official Partnership Entrance, you will beat the lines to the Sistine Chapel, Raphael Rooms and St. Peter's Basilica. Visit the two most important attractions in Rome in one day – the Vatican and the Colosseum. See the Vatican Museums, Sistine Chapel, St. Peter’s Basilica, then explore the Ancient Roman Forum, Palatine Hill, and the Colosseum. Contemplate the Sistine Chapel in peaceful reflection before the general public arrives and then explore the rest of the Museums on your own. Discover the Sistine Chapel and Vatican Museums at your own pace with these Faster Than Skip-the-Line tickets. Our official Vatican partnership allows us to get past the long lines quickly, so you have more time to explore! As an Official Vatican Museums Partner we‘ll get you in before staff doors open for an exclusive breakfast in the Vatican Courtyard. Then, explore the treasures of the Sistine Chapel and St. Peter‘s Basilica without the crowds. Our most complete and comprehensive Vatican Museums tour. This exclusive experience will include hidden gems and normally off-limits areas that few others get to see thanks to our Official Vatican Partnership. Just you and your private guide, have one-on-one interaction as you experience the Sistine Chapel, Vatican Museums and St. Peter's Basilica, for the most intimate and unique way to visit the Vatican. Enjoy exclusive access to the Vatican 1.5 hours before the public via our special Official Partner Entrance so you can experience the Sistine Chapel without the large crowds. Then discover St. Peter's Basilica & Vatican Crypts. We are the only operator offering this exclusive tour. You’ll enter 1.5 hours before the crowds and enjoy a buffet breakfast. Then stroll in the Vatican Gardens before visiting the Museums, Sistine Chapel and St. Peter's Basilica. Enjoy the enchanted evening as our expert guide brings the Vatican's masterpieces to life, during a special night opening, when the Vatican Museums and Sistine Chapel are much less crowded. Get the most out of this once-in-a-lifetime experience with our expert guide's insight into the rich history and traditions of the Papacy and the Papal Audience ceremony. We secure you the best seats available and guide you inside. Our most complete and comprehensive Private Vatican tour. This exclusive experience will include some Vatican Museum hidden gems that few others get to see due to our Official Vatican Partnership. Explore the best of the Vatican Museums on this 2-hour engaging tour for families with kids aged 7-12. Skip the lines and let our expert guide breathe life into masterpieces like the Sistine Chapel, and St. Peter's Basilica. Combine two of Vatican City’s attractions in one day. Explore the Museums and the superb Sistine Chapel before boarding the Vatican train to Castel Gandolfo, the personal Summer residence of the papacy since the 17th century. Enjoy Rome’s two most famous sites at your own pace with this special combination offer. Our unique Vatican partnership and privileged access to the Colosseum means you’ll skip the line like a VIP and have more time to explore at both attractions. Produced by Marco Balich, The Last Judgement is an unforgettable theater experience. This performance will bring the Sistine Chapel, The Last Judgement and Michelangelo to life using live theater and powerful projections. We have been designing tours and have hosted more than 1.5 million guests over 15 years. For 6 of those years, we have been the only Official Vatican Partner that concentrates on guided tours. Supporting us are a passionate team of expert guides who will take you through the countless masterpieces of this living museum. They include art-historians, sculpture-lovers and those who have a lifelong fascination with learning. Our mission is to ensure that you get the benefit of their inside knowledge. We know this is a one off choice for you and we want to make it count. Our tours are about more than just facts. Depending on the memories you want to make, we have specially crafted family tours, private tours and exclusive night tours. You can even treat yourself to an early morning VIP breakfast in the Vatican Museums before they open to the public. All our tours are renowned for their stories and the hidden details we find to create “something extra” for our guests. Choose the tour that appeals to you and let us make your Vatican dream come to life. We’ve guided more than 1.5 million people through the Vatican. We’re the highest rated, best-loved Vatican tour operator, and our reviews prove it!